Recently, Black Tie Moving received one of the highest distinctions a young business can, ranking #391 on Inc. 500’s fastest-growing companies list. 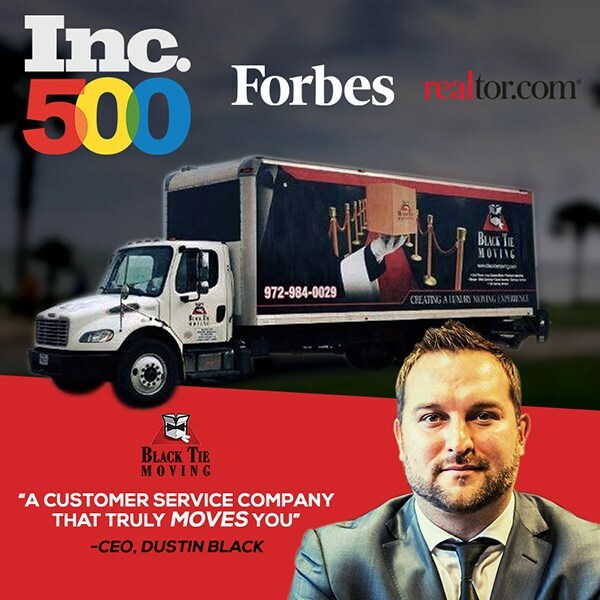 To founder Dustin Black, this achievement represents a collective professional triumph earned through the high-quality work and attentive customer care of his expert moving staff. “We want to keep solving problems in the industry. We want to keep solving problems with the [moving] process, making it easier for the customer, creating a better sense of transparency during the process,” Dustin stated as he outlined Black Tie’s goals. Black Tie’s red carpet moving experience has been publicized by some of the most notable media outlets in the country, and its luxury relocation services have earned the endorsement of high-profile clients, ranging from celebrities to a professional sports team; but Dustin’s decision to make these services affordable and accessible to all has, now, put his company on the national map. Part of Black Tie’s appeal to many customers is the pageantry; with movers sporting tuxedo t-shirts and the unfurling of an actual red carpet, Dustin and his team use somewhat cheeky visual elements to express a very serious promise to each client: you are the star and top priority on moving day. But what keeps this from being simply a novel gimmick is Black Tie’s understanding of what really matters to someone moving their household and livelihood. Thousands of homeowners across California, Texas, Tennessee and Georgia would agree, with presumably more to come once Black Tie opens its three new locations in Ohio and expands it service areas in Texas and Georgia. Even on the heels of their Inc. 500 ranking, when many companies would still be basking in the glow of increased national attention, innovation remains the name of the game for Black Tie. Dustin and his team are currently preparing for the fall roll-out of their full, in-house concierge service, which pairs each of their clients with a dedicated move-in manager that helps coordinate all the vital, but time-intensive tasks that come with moving, like utility transfers, furniture assembly and cable and internet hook-up. Dustin sees the new concierge program saving Black Tie customers an average of 8-10 hours during their move, and more importantly, bringing their services that much closer to capturing the perfect, streamlined moving day experience. It’s one thing to preach quality, but Dustin believes the key to providing a consistent level of exemplary service is having high-caliber personnel that value best moving practices, communication and constantly improving their own process. It’s that same dedication to ongoing training and process improvement that helps Dustin and his Black Tie crew capitalize on growth opportunities during slow seasons—a unique challenge not shared by many companies on this year’s Inc. 500 list. Dustin doesn’t see knee-jerk decisions to downsize during slower months as the answer. “We can’t hire 100 movers in the summer and lay 50 off in the winter,” he affirmed. Instead, the Black Tie team uses seasonal downtime to grade mover performance and develop solutions for improving their services. It’s a strategy that encompasses the simple ideology behind Black Tie: pursue innovation first, and the accolades will follow. This year, Inc. 500 recognized Black Tie’s vision, and it’s likely that they—and many others—will have their eyes on Dustin and his “tuxedoed” movers well into the future.